Express Delivery « WePost4U.co.uk – The distribution experts…. 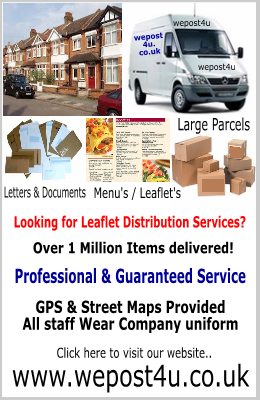 We also offer a express service for businesses which require a fast delivery of a large quantity of leaflets within a specified time scale. For more information and a free quote please call us to discuss your exact requirements. LETTER & SMALL PACKAGE Express Delivery within 5 Hours to any destination. For more destinations please call us on 07450 270 221 or Email: sales@wepost4u.co.uk to discuss your requirements.